It was bright and sunny but cold, minus 1 on the thermometer with a wind chill of -9. Warmly dressed I set off from home on foot. I headed to Sherwood Park to cut out to Blythwood Ave. A few trees in the park are holding onto their leaves. These three trees are distinctive in their colouring. 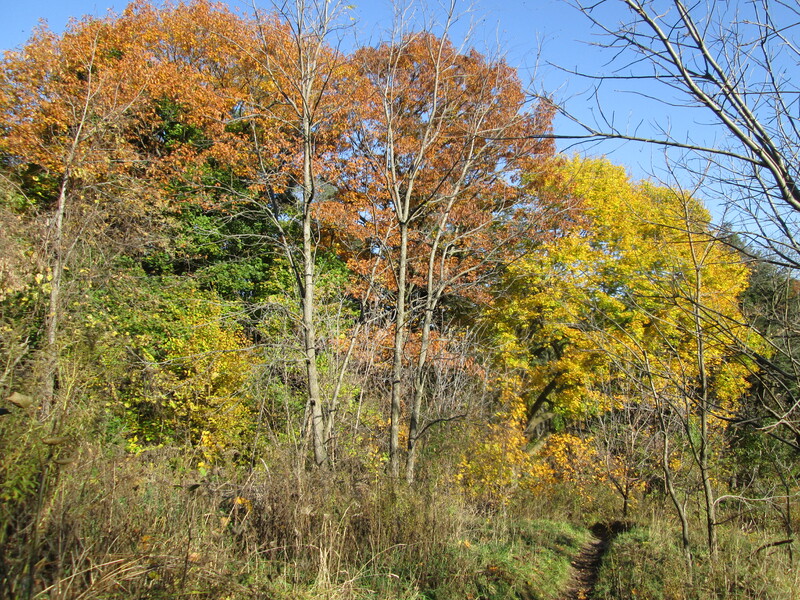 The yellow one on the right is a maple, the rusty one in the middle is an oak and the orange on one the left is an aspen. In the early 1920’s it became fashionable for Toronto’s wealthy to want a country estate on the edge of the city. The area of First Line East (Bayview Avenue) and 5th Side Road (Lawrence Ave) was ideal with Don River Ravine lots. One of the largest tracts was 175 acres which belonged to Alice and Joseph Kilgour. It is at the end of Blythwood and stretched from Bayview to Leslie. Many original buildings including the barns and stables remain in use. The cover picture shows the estate as it looked in the 1920’s. When she passed away in 1928 Alice gave the property to the city on condition that it never be developed. The influx of injured soldiers during the second world war created a need for a new hospital which was originally to be called Soldier’s Military Hospital. 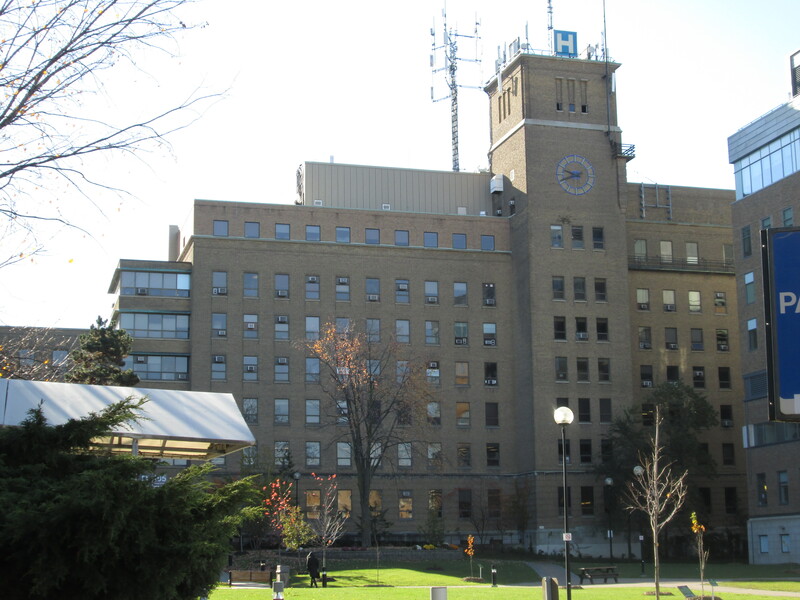 Today it is known as Sunnybrook Health Sciences Centre. Tucked away in behind the newer hospital is the original building with it’s clock tower. The date stone shows that it was laid on Nov. 10, 1945. As we come to Remembrance Day 2014 it is fitting to think of the sacrifices that so many made to secure our freedoms. Sometimes we remember the dead but forget that so many were injured that we needed a new hospital just to cope with them all. In 1928 James McLean, the president of Canada Packers, bought 50 acres of land overlooking the Don river on which to build his estate. He called the property Bay View, leading to the changing of the name of First Line East to Bayview Avenue. When McLean and his family moved into the house in 1931 they employed 4 gardeners for the upkeep of the grounds. 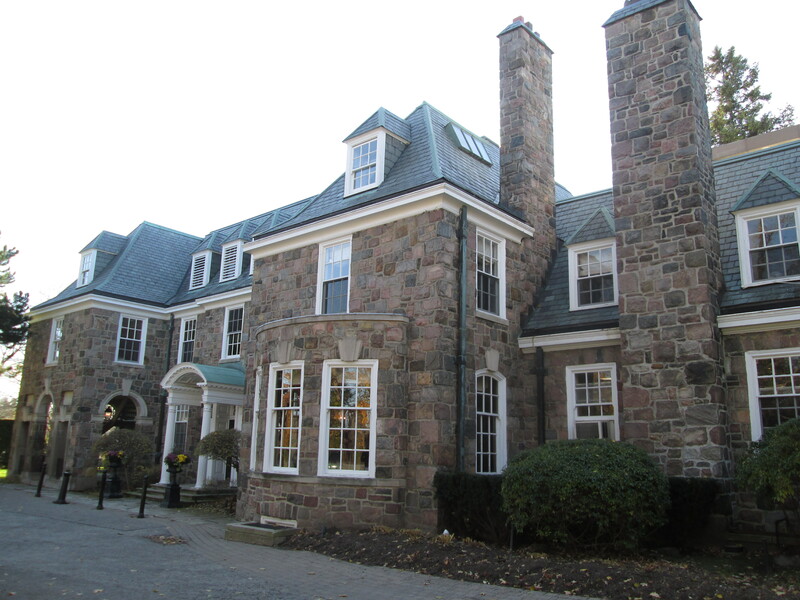 Today the home is known as McLean house and it is on the grounds of Sunnybrook Hospital. 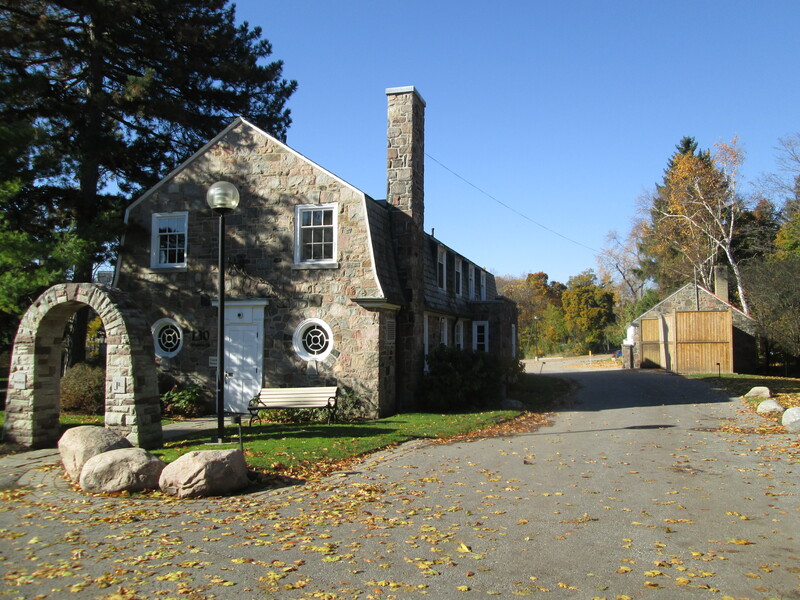 Many of the Bayview Estate owners had horses and McLean was no different so a separate coach or carriage house was built to store the carriage and the tack. John James Vaughan was the vice president of T. Eatons Company in 1930 when he had Donningvale built on 31 acres of land on the Don River. It was grandly appointed with mahogany and large fireplaces. 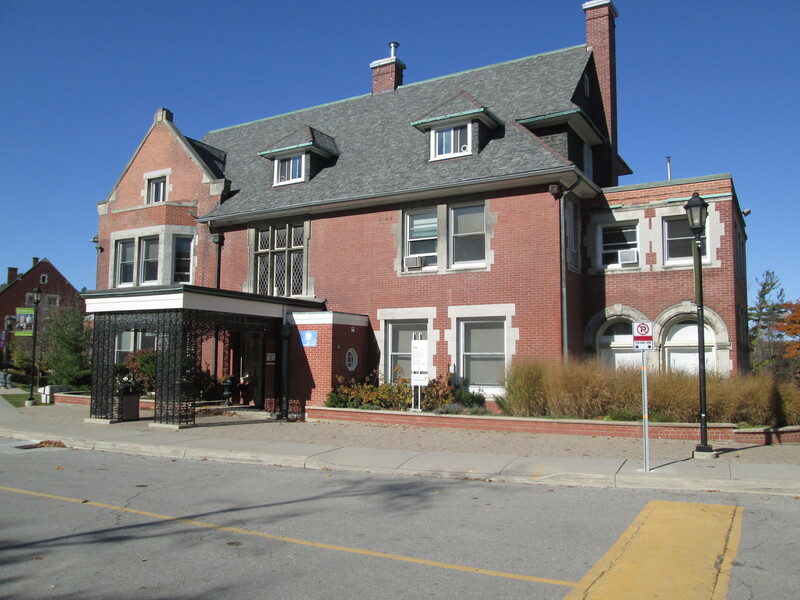 It too is now located on the property of Sunnybrook Hospital. 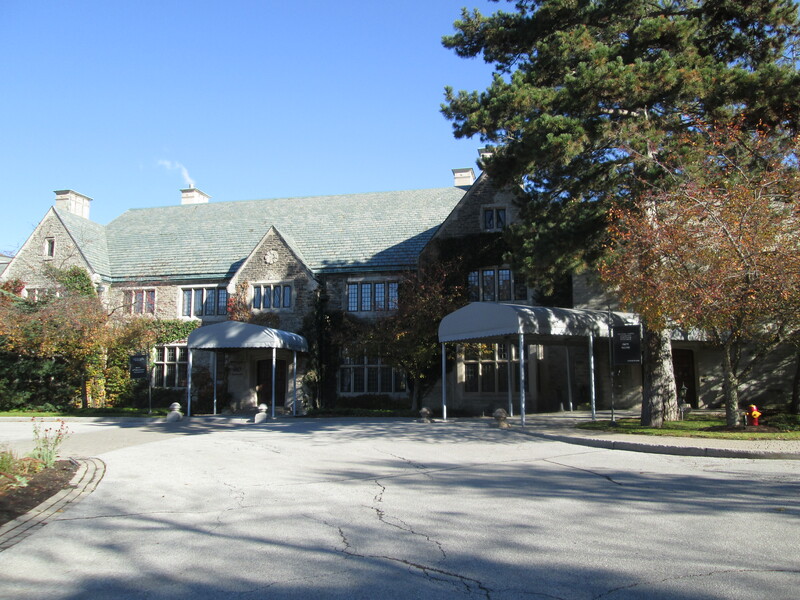 In 1920 Edward Rogers Wood purchased 85 acres of land nestled into a glen on the Don river where he set about creating the aptly named Glendon Hall. Wood had made his fortune as president of the Bank of Commerce and Canada Life starting when he was just 30. The property had been in use as a farm and the land was fully cleared of trees. Wood brought in mature trees and built gardens that became internationally known for their beauty and the speed with which they were built. Wood had spent forty years as a millionaire quietly donating his fortune to hospitals, churches, and universities. In 1959 when his wife Agnes passed away it became known that they had made their last and greatest gift by leaving their estate to the University of Toronto. In turn, U of T gave it to York University in 1961. 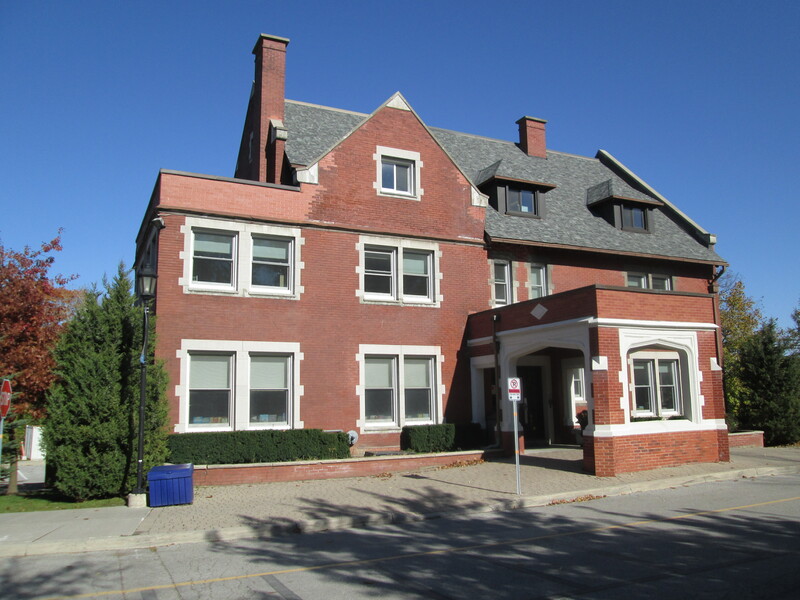 The property now is in use as York University Glendon Hall. Bayview Avenue was originally known as First Line East and then later as East York Line because it divided Toronto from East York. 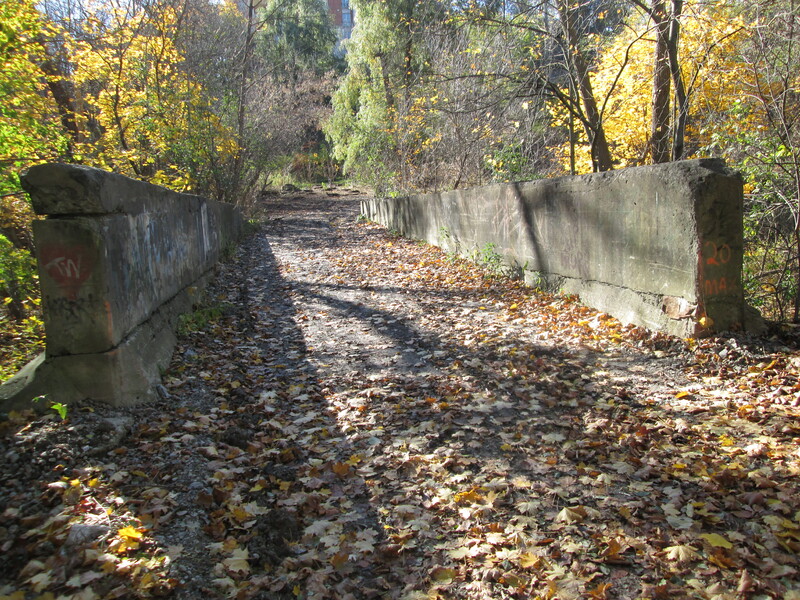 Until 1929 it was a dirt country road which crossed the West Don River on a single lane bridge. When Bayview was widened it was also moved to the west and given a new bridge across the valley. The first Bayview Bridge was built in 1891 and has been abandoned for 85 years and the old road allowance is becoming grown over. Just past the new Bayview bridge on the west side of the river is the full contents of an old home. A fridge, stove, washing machine, and many other items have been thrown down the embankment. 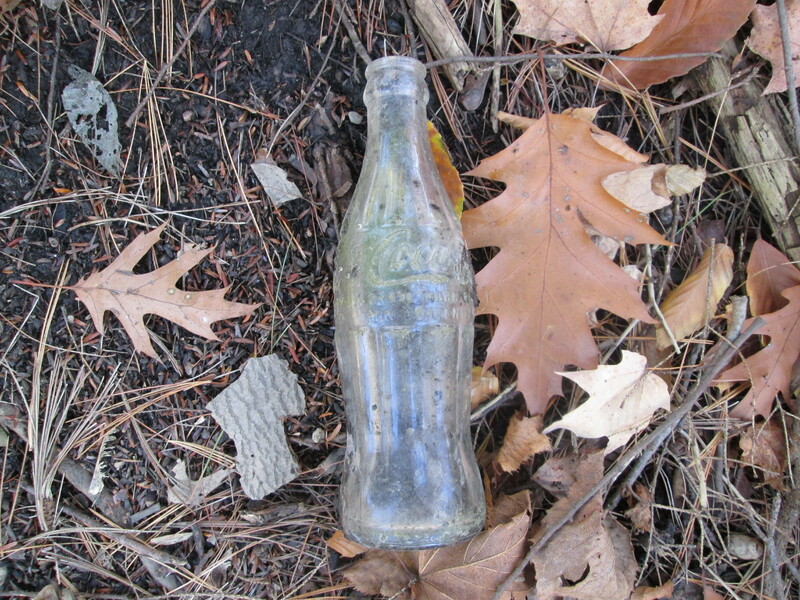 Lying among the oak leaves I found a 1944 Coke bottle. This is the oldest soft drink bottle that I have brought home so far this year. Clifford Sifton was influential in Canadian politics at the turn of the twentieth century. He was the minister of immigration and was key in the development of the Crows Nest Pass agreement. American railways were extending their lines into southern B.C. to take advantage of the minerals that had been found there. At the same time, prairie farmers were complaining about the high rates charged for moving their grain. This made it political suicide for the government to fund the railway expansion. Sifton negotiated a deal that funded the Canadian Pacific Railway extension through the pass and secured permanently lower rates for the farmers. This also served to protect Canadian interests in lower B.C. In 1923 he built this 22 room mansion on 26 acres of land on the former Lawrence property on the north west corner of Lawrence and Bayview. Like the other estate owners in the area, Sifton was into his horses and kept riding stables on the property. The area just north of here is known as The Bridle Path because of it’s horse trails that used to cater to the Bayview Estate owners. Sifton only got to enjoy his dream of living on a country estate for a few years as he died in 1929. This house was built for Clifford’s son, Clifford Sifton Jr. It was complete with a swimming pool. 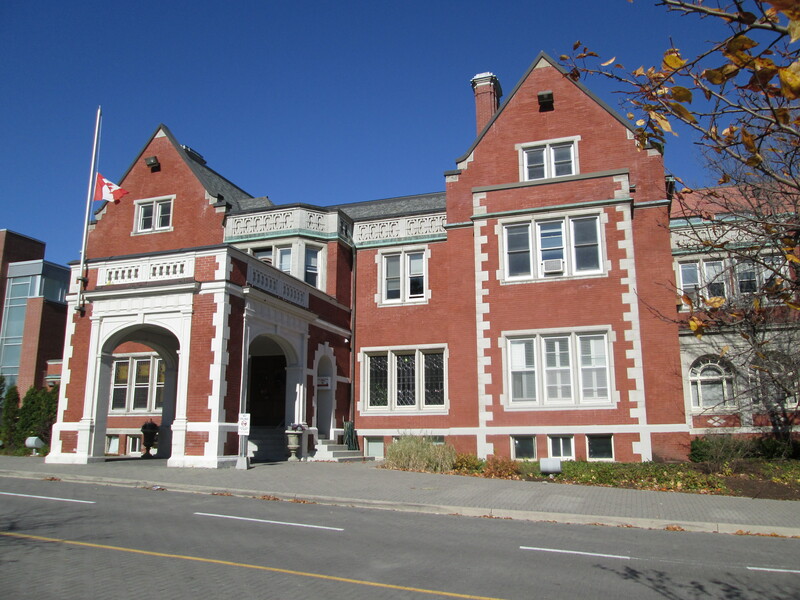 A third house was built on the estate for his other son, H. Arthur Sifton. These three homes are now part of the Toronto French School. For about 30 years from 1925 to 1955 the Bayview and Lawrence area was a pastoral country home to many of Toronto’s most influential people. Today, their grand homes are almost forgotten in the bustle of mid-town Toronto. 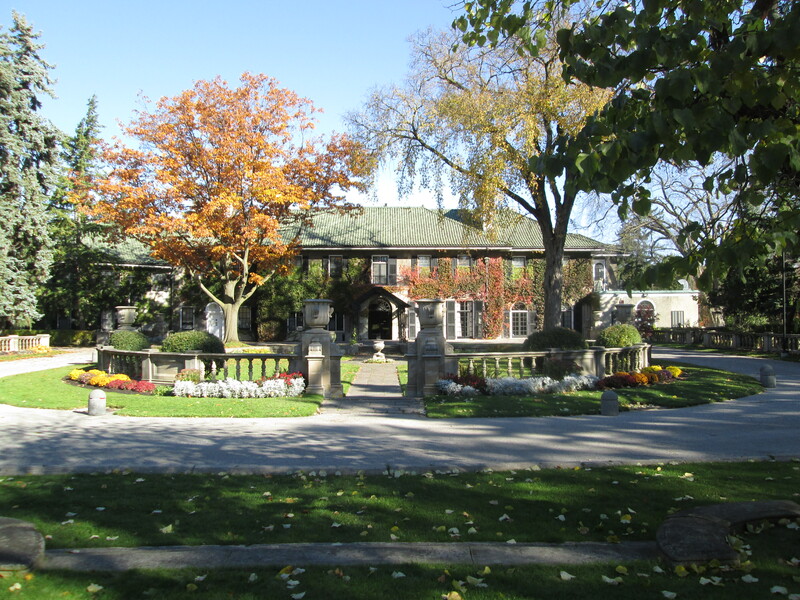 Toronto’s millionaires have located onto The Bridle Path making it the most affluent community in Canada. According to my pedometer I made it back home after 16173 steps. Looking for places to explore? Check out Greatest Treks and Greatest Treks 2 for 30 of the most popular hikes. This entry was posted in Don River and tagged Bayview Estates, Donglen Estate, GTA, Hiking, Kilgour Estate, Lawrence Avenue, McLean House, Sunnybrook Farm, Sunnybrook Hospital, Toronto French School on November 3, 2014 by hikingthegta. You are correct. It was originally given to U of T who gave it the new board of directors for York U in 1961.